Fatfish offers fish, chicken, steak, pork, pasta, tapas and more in an attractive setting overlooking the Great South Bay. As the name suggests seafood is the theme at Fatfish. It’s good thing too because after three hours on a boat, I was in the mood for fish. We’d had just come back from the annual Boating with the Baymen tour and had worked up quite an appetite. After leaving another seafood restaurant in Bay Shore because we didn’t want to wait “35 minutes to an hour” we ended up at Fatfish. We were greeted by a very pleasant hostess and seated outside immediately. A waitress appeared on the spot and took our drink orders; Stella Artois all around. A cool breeze blowing off the bay was refreshing at first, but after a while became a little too cool. Just as I was becoming uncomfortable the transparent plastic panels lining the dining area were lowered, as if they had read my mind. The service we had received so far and attention to the weather was reassuring. I had a feeling that the service would be good here, and I was right. 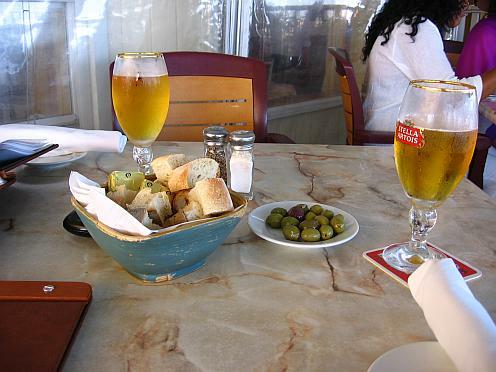 Stella Artois, a Belgium lager, is a favorite of mine when dining on the water. Our beer arrived promptly along with a selection of olives and bread, and now that we were settled I had some time look around. 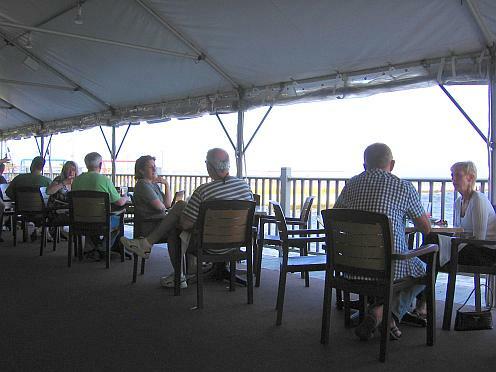 The outdoor dining room at Fatfish offers a beautiful view of the Great South Bay and is covered to protect diners from rain and sun. The dining area is nicely appointed with marble tables and stylish plastic chairs. The chairs, attractive as they were, were just a little uncomfortable. No real complaint here, it just seems like the quality of table and chairs should match. The bar is nicely separated from both the indoor and outdoor dining areas on a lower lever adjacent to the indoor wine bar. This kept the bar noise out of the dining room which is something I always appreciate. The wine bar looked great, but it was empty. No real surprise here—everyone was outside. Beyond the railing is the Great South Bay. You are dining right on the water. Although the emphasis is on fish the Fatfish menu covers all bases. For the appetizer we had a choice of fish and traditional tapas, a variety of European cheeses served with chutney, bread, biscuits, and figs, the raw bar, ice towers, and the standard appetizer menu offering everything from lobster to smoked chicken. 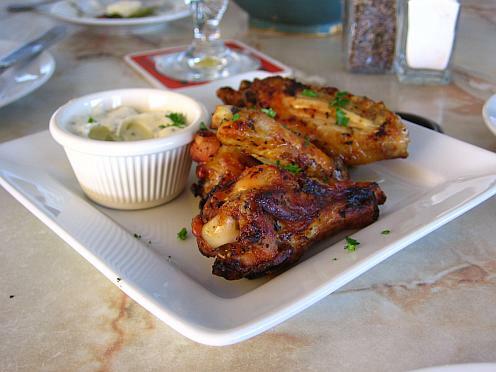 From the tapas section we tried the lemon and thyme roasted chicken wings with horseradish Dijon mustard sauce. This was a nice variation on the standard buffalo wing appetizer offering all the flavor of roasted chicken with the convenience of finger food. The dipping sauce was a nice touch but unnecessary as the chicken was quite good all on its own. Deciding on the main course was much easier than choosing the appetizer. As soon as I heard our waitress say “soft shell crabs” as she recited the specials menu my mind was made up. Karilyn ordered the 16oz rib eye steak medium rare. 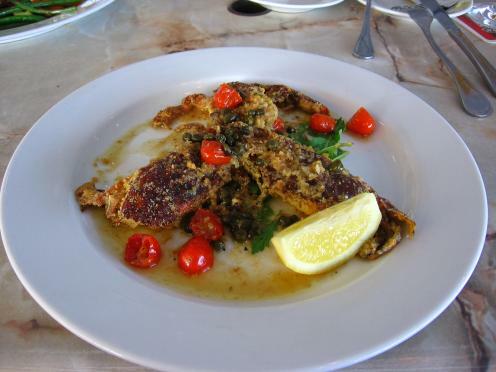 I’ve been eating soft shell crabs since I was a very young boy and I distinctly remember the first time I tasted them. At a restaurant on the Nautical Mile in Freeport my father ordered soft shell crabs just as he had done so many times before. But this time something registered in my little boy brain: crabs have hard shells, not soft shells and I wondered what kind of creature this could be. I ordered them for lunch too instead of my usual hamburger and I have been hooked ever since. Our entrées arrived shortly after we finished the appetizer and I was disappointed to see 3 small crabs in my plate instead of the 2 large crabs that are served in most other restaurants. That disappointment turned to excitement after the first bite. The crabs were sautéed in butter & lemon with capers, cherry tomatoes, shallots and a small amount of what I think were panko crumbs which gave them a slightly crispy texture. These were the best tasting crabs I ever had in my life and I’ve eaten a lot of soft shell crabs. 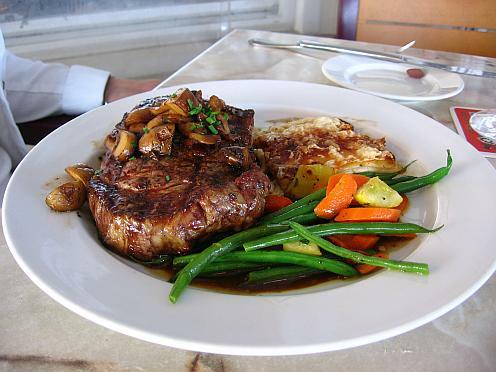 The rib eye was cooked medium rare exactly as ordered, and was thick, tender and juicy. This was a good steak. It’s nice to see that Fatfish takes their steaks as seriously as their seafood. It’s hard for me to get excited about vegetables, but they were good too. 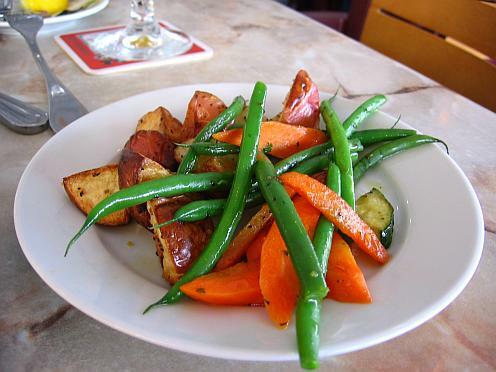 Brightly colored, yet not undercooked, and the potatoes tender and sweet. Everything came to the table hot and service was excellent throughout the meal. There was no room for desert and coffee so I can’t comment on that however, I was temped by a nice selection of cognacs, desert wines, and after dinner drinks. Next time I’d like to try the fried oysters or maybe the whole bronzini. There’s a lot of food on this menu and based on what I’ve had so far, I’m willing to bet it’ll be just as good. This is one complaint I have and that is the absence of local products. None of the fish served here is local, and there are no Long Island wines on the wine list. In my opinion, and this is just my opinion, the easy availability of these local ingredients leave no excuse for not using them. As with most waterfront dining establishments prices at Fatfish reflect the venue. 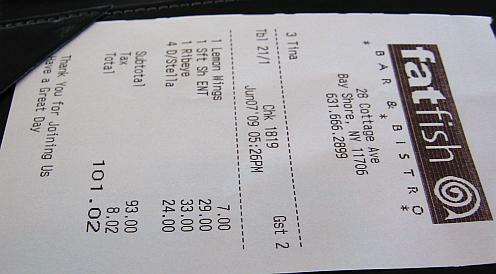 I felt the $100 tab for this meal was not unreasonable, and the waitress definitely deserved her $20 tip. I'd come here again.